I want to volunteer at JHS! 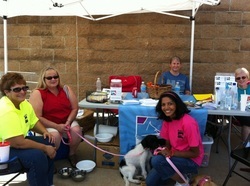 At the Joplin Humane Society, we are proud to have the support of so many wonderful volunteers. Our dedicated volunteers make a commitment to help our organization by touching the lives of both pets and people every day. Their decision to put their concern for animal welfare into action by offering to donate time is such an important asset to us. We have many opportunities for volunteers at JHS. Thank you very much for your interest in volunteering with the Joplin Humane Society! Our success depends on YOU! If you are ready to volunteer, there are many opportunities for you to help the animals either at the shelter, at an off-site event or even from home! ​How do I get started? Please fill out an application to begin the process of becoming a JHS Volunteer or you can visit the shelter and apply in person. We appreciate your patience as we build and focus our volunteer corps for the betterment of the animals. All volunteers must begin with Basic Orientation. Volunteer Orientations are held a minimum of once a month, dates are also posted on our Facebook page. Please Note: JHS volunteers must be 16 Years of age or older to volunteer without a guardian present. Junior Volunteers, age 10-15 may volunteer with a parent or guardian, however there are additional requirements (please see Volunteer Manual). If you have any questions, please email Tasha at volunteer@joplinhumane.org or by phone at 417-623-3642 x120. After receiving your application, you will be contacted to arrange an orientation meeting and to discuss your volunteer interests and the shelter's available opportunities.